Will Smith celebrated 50 years old. Bungee jumping is probably not for everyone, but at least he will not forget his big day. 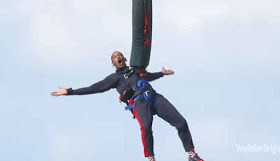 And that was not a standard bungee jump, the star chose a helicopter over the Grand Canyon, watched by his family and friends. Will shared the moment on his YouTube channel and as soon as he made the jump, but still dangling, he said, "It goes from pure terror to sheer bliss." He seemed a bit nervous just before the jump, but he came soon and blew kisses into the crowd. His wife Jada Pinkett Smith and his three children Trey, Jaden and Willow saw together with his friend Alfonso Ribeiro, who played Carlton in The Fresh Prince by Bel-Air. Happy 50th to him!